By Ahmed Tabaqchali (pictured), CIO of Asia Frontier Capital (AFC) Iraq Fund. The positive momentum which started during the second half of January continued unabated throughout February with both prices and turnover increasing meaningfully. 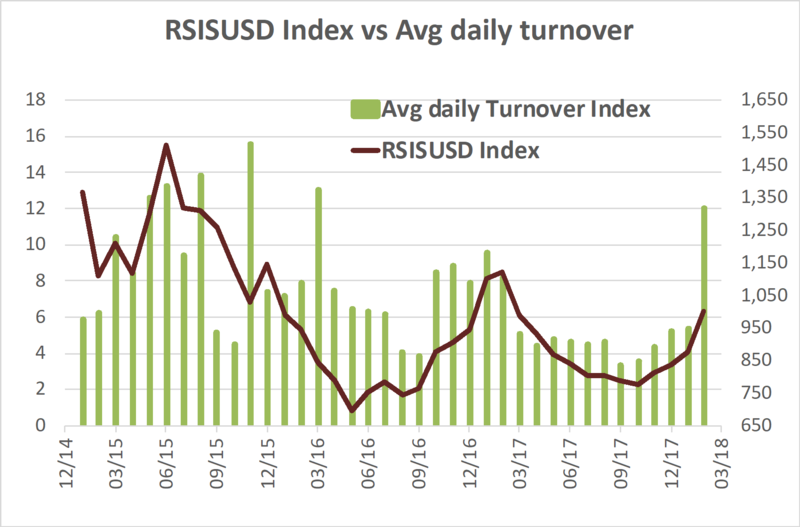 The market, as measured by the RSISUSD Index ended the month up +18.5% and +20.1% YTD. The average daily turnover reached the same levels last seen in early 2016 that were marked then by two significant events: the first being the sale of HSBC’s 8.8% holding in Dar Es Salaam Bank, while the second was the liquidation of a sizeable foreign Iraq fund for a total amount of around USD 20m. The two events combined with the then collapsing oil price had a devastating impact on the market in which heavy selling sent the average daily turnover higher and prices lower (see chart below). Foreign investors, in an almost mirror image reversal, have been net buyers to a much larger degree than in prior upturns since the May 2016 bottom. However, the increase in foreign buying as a percentage of total buying has been less than that of the increase in absolute foreign buying, indicating that while foreign buying might have been a catalyst it was local buying that drove total buying. 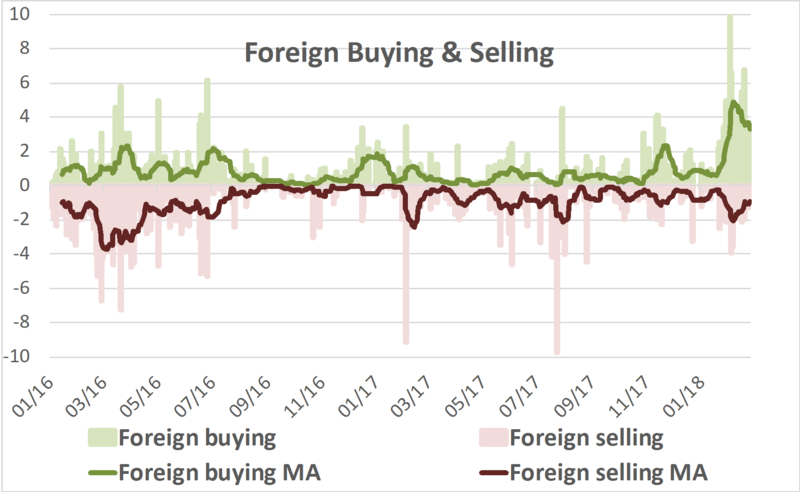 Foreign selling, both in absolute levels and as a percentage of total selling has been in-line with those of the last few months. The chart below shows these and the mirror image symmetry of the current market vs. that which prevailed in early 2016, yet it suggests that the current phase is in its early stages and that an increase in liquidity would need to be maintained for the rally to be sustained. Early, but narrow market leadership by high-quality names such as mobile operator Asiacell (TASC) and Pepsi bottler Baghdad Soft Drinks (IBSD) that started the recovery in December has expanded in February to include high quality names in the banking sector. The foreign buying interest that was focused then in these two names has also expanded to include the same higher quality banking names. Fundamentals continued to be what fuelled the buying interest as discussed in January’s article. In the case of the banks the fundamental change has been a bottoming of the negative developments that prevailed over the last three years, i.e. declining/negative deposit growth, declining/negative loan growth and increasing NPL’s (non-performing loans). Their outlook is brightening as the expansionary effects from the reversal of escalating costs of conflict and collapsing oil prices that crushed the economy in 2014 provides the banks room to recover further and grow. The banks’ own confidence in their outlook was discussed in July’s article when high-quality banks declared dividend yields of up to 11%, while valuations were attractive with these banks’ market capitalizations trading at under 20% of their assets, which themselves were over 70% in cash and cash-equivalents. The fundamental reasons for market leadership is the main characteristic that differentiates the current rally from that of October 2016-February 2017, in which the then leadership was concentrated in names that were extremely leveraged to the economic recovery post-conflict. Then, sharp rallies in lower priced and lower quality but high beta stocks drove the market’s gain as reported in AFC’s October 2016 newsletter. It was argued then that, “this should dissipate as high-quality stocks resume market leadership as part of the market bottoming and eventual recovery process”. While this seems to be the case now, it is still very early in the recovery process and remains to be seen if this recovery will extend and broaden out over the next few months. The natural question is whether this rally is sustainable, i.e. whether the market will stabilize or move sideways before resuming its uptrend or even decline. Part of the clue may come from the MSCI Emerging Market and the MSCI Frontier Market indices, which Iraq’s outlook for 2018 argued were leading the RSISUSD Index by about 6 months. If this observation and the correlation were a guide, then the RSISUSD index should consolidate before resuming its rally. 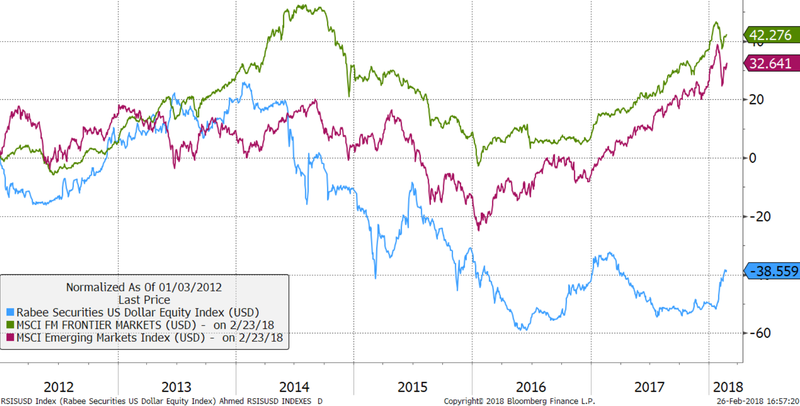 While this argument has merit, it should be noted that the fund inflows to the MSCI Emerging Markets & MSCI Frontier Market indices’ underlying markets are different from those for Iraq and driven by factors specific to the underlying markets’ own fundamentals. The increased liquidity in the form of both local and foreign inflows needs to be maintained for the market’s recovery to be sustainable. Given the time lag involved, this will likely unfold over the next few months and the recovery will likely be in fits and starts with plenty of zig-zags along the way. This underscores the opportunity to acquire attractive assets that have yet to discount a sustainable economic recovery. 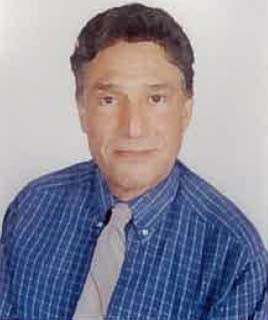 The outcome of the Kuwait conference for the reconstruction of Iraq, in the form of loans/investments for the initial stages of the reconstruction drive, will likely add fuel to the expansionary effects from the reversal of escalating costs of conflict and collapsing oil prices that crushed the economy in 2014. The coverage of the conference was confusing at best and which this article by the author, “It’s not the donations, stupid”, discusses and puts into a clearer perspective.